My trip to the Americas a few months back had introduced me to a Bourbon that I’ve seldom heard off here in India; never seen at the local liquor stores, the duty free shops or from the mouths of colleagues, peers, friends and coworkers. In fact, the pronunciation of the tag on the label itself sounds perilous that it might be mistaken for some kind of country liquor that if consumed can pack a mighty punch, not to mention the harrowing hangover the following day! 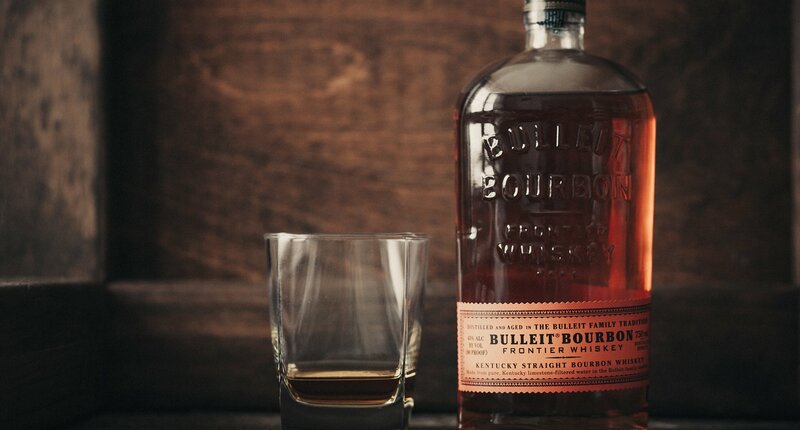 The Bulleit is named after its maker, Augustus Bulleit who made his first batch somewhere in the year 1830s using a rye and corn mix in the ratio of 2:1. The production of this rye whisky was discontinued after his death; however, they still have a rye version available in the market. The Bulleit Frontier was created by Augustus’s great-great grandson Tom Bulleit and is made of 68% Corn, 28% rye and 4% malted Barley, fermented using their own proprietary yeast culture and aged in newly charred oak barrels for around 6-8 years. The bottle resembles a pocket flask with a steeper curve at the shoulder, a longer tapering body and a flatter bottom. The embossed name on the glass surface adds to its uniqueness but in no way uplifts its physical appeal. Nose: Quite a bit of spice initially, owing to the high proportion of rye in the mix. Following which you get the sweet, woody oakyness , burnt caramel and the scent of roses coming through. Fruity notes such as banana and cherry while spices like nutmeg, cinnamon along with a slight yeastiness introduces itself in waves in the midst of all that fruit and floral trails. Taste: Lovely burnt caramel and wood with many of the highlights from the nosing echoing on the palate. Cherry, maple and bananas, spices such as nutmeg, pepper and the after taste of cloves make an appearance prior to moving on to the finish. Finish: Spicy (after taste of cloves), dry and long. The Bulleit, from the house of Diageo is definitely flavorsome, rich and sweet. The unusually high mix of rye and the effect of charred oak on the aging spirits have resulted in a harmonious amalgamation of both spice and vanilla. If I were to critic, it would be the sweetness, maybe a tad too much once you are on your 3rd dram (for the chuggers!). Nevertheless, I feel this spirit is certainly a delight for the senses and makes drinking a pleasurable fun ride. Knowing the flavor profile, this liquor can be savored neat or as a cocktail and either ways be rest assured it shan’t disappoint! It’s a pity that Bourbons aren’t as popular as Scotch here in India; knowing the difference in flavors between the two, it surely would have been worth to have a variety available. I’ll be surprised if you could get your hands on a bottle of the Bulleit here in India, and in case you do…please be sure to holler!